Blood Grouping & Typing AntiSera | ARKRAY, Inc.
Spanclone is a Monoclonal Agglutination Sera for the Determination of Human Blood groups (ABO). High avidity with clear cut visible agglutination. No cross reactivity with acquired B Antigen. Free from HIV-1/2 antibodies, anti-HCV antibodies and HBsAg. Colour coded reagents for ease of identification and interpretation, confirming to international Standards. AABB, FDA & NIBSC guideline, (UK) are followed for standard. 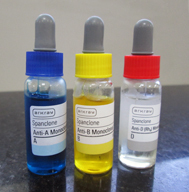 SpanClone Anti - A, Anti-B & Anti-AB (Monoclonal). 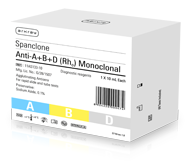 SpanClone Anti-D (Rho) (Monoclonal) - IgM & IgG+IgM.